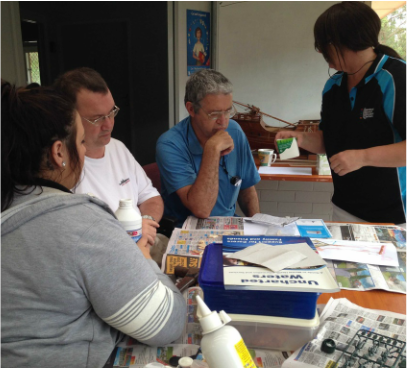 In September 2015, 4HR was contacted by Stuart from Delphis Australia, part of Central Coast Care Network. This was regarding some of their clients coming to Henry Kendall Cottage and Historic Museum to view some exhibitions 4HR had on exhibition there. So impressed were those who attended that they couldn't wait to get back to tell others about it. In total, Stuart brought three separate groups form Delphis to the Museum. Later Stuart contacted 4HR enquiring if it was a reasonable idea to involve some of the clients in a 4HR project and discussions regarding this commenced. Inspired by what was evolving with Delphis, 4HR contacted Central Coast Disabilities Network (CCDN). Mami volunteered and provide some invaluable assistance. Left: CCDN promptly took up the offer to commence a 'History Modeling Group' with them. Two, two hour sessions on Wednesdays and Fridays were arranged. The first weeks were tentative but soon everyone got into the swing and began to enjoy the sessions. Mami Adderley came along to assist, even though like most of the women involved, she had limited experience at doing 'blokey' stuff like building plastic kits of German tanks. ​When a 1:72 Zero kit arrived everyone noted with a little amusement how well she helped put it together, Mami is Japanese you see! 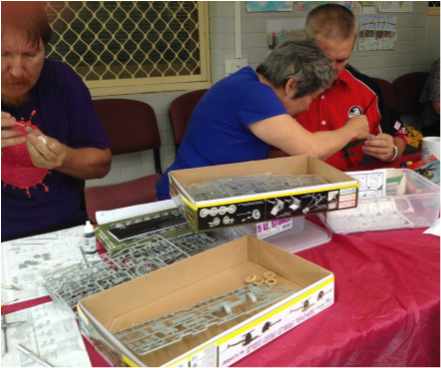 With one of the skilled volunteers leaving the project, Peter went to the local media to try and get assistance from the Central Coast model making fraternity. L-R Ray, Lee and James start to disassemble the rigging and masts of Lee's Santa Maria. Above: With one skilled volunteer suddenly leaving, the whole project looked in question and so an appeal went out via local media. ​The answer came through Ray Crawley, 4HR's Peter Rea had met Ray when they were both invited to exhibit their works at 'Breakers' RSL Club Terrigal for Anzac Week Centenary in April 2015. ​Right: Only the week before Lee had brought in this deliberated model of Columbus flag ship Santa Maria. Ray coming into the program, with his wood working skills, was very timely. 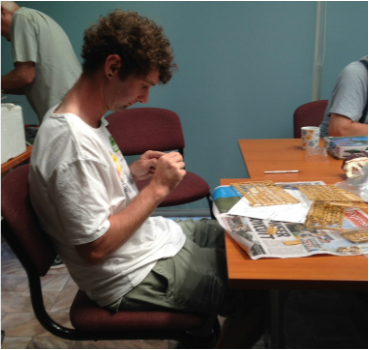 Ray (left) and CCDN staffer James (right) assist Lee (centre) with the 're-fit' of the ship. The decking, masts, rigging and sails were removed. The sails were cleaned of mould and Ray had Terrigal Mens Shed mill new decking planks. Lee has been busy sanding and fitting these over the past few sessions. It really was like Christmas as Angela's uncle David's donation of kits were unpacked. 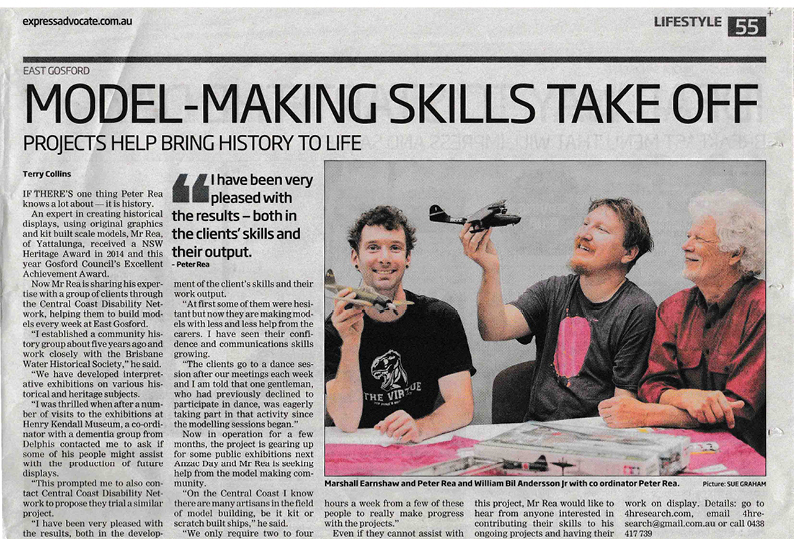 While the newspaper coverage received a very disappointing response from the Central Coast's model making fraternity, a lady named Angela did contact us. The information was a surprise, at 85 years old, Angela's uncle David had just left his own home and gone to a retirement home. He was an ardent model maker who could never pass up a bargain, therefore he had collected far more model kits than he ever had the time to complete. So on behalf of her uncle David, Angela offered 4HR's disabilities project six large boxes full of kits, some partly completed, most untouched. Aircraft, ships, tanks, figurines...hundreds of them. Right: The guys as well as Rebecca from CCDN were totally delighted when the first box was taken in and opened. The basic plan for the model, a section of hull will be made to fit the engine into. Probably the boiler will be added along with engine room staff figures. Meanwhile Delphis, Central Coast Support Services started on parts of two projects. 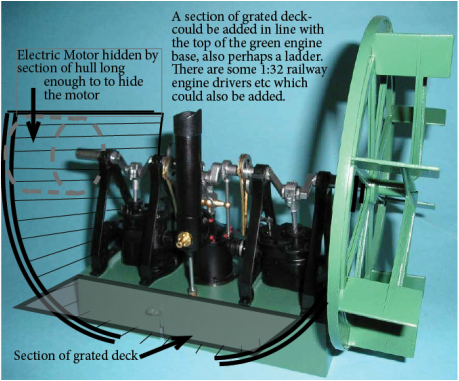 Project One: To build an Airfix Munsel Steam Engine, add a boiler from Duncan Models, a few appropriate figures and place it in a section of scratch built hull. So far only the steam engine has been built for this project. Project Two: Build a diorama depicting an RAAF Bruster Buffalo being attacked by one of three Zeros over Singapore. The diorama display box has been completed and the models are in hand, with building the four aircraft about to begin. Bill's knowledge of the subjects is incredible, he is also proficient in CAD and 3D modelling. With the general skills of many CCDN clients brought up to scratch during the beginning weeks, a meeting was held to decide on a project, Lee's Santa Maria. ​Peter proposed a couple of dioramas on the Greek and Crete Campaigns of 1941. He explained that an author he had an admiration for, Peter Ewer, had written a book about the actions called 'The Forgotten Anzacs'. The meeting decided to 'Remember' these soldiers by producing a couple of dioramas. 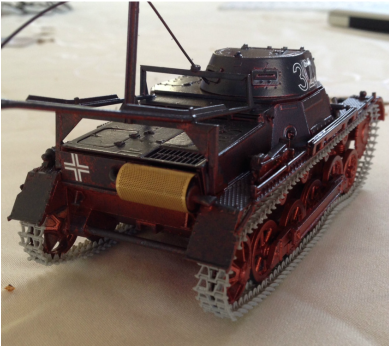 Right: Billy did a great job building this panzer for the Greek campaign diorama, he is currently assembling a knocked-out British Crusader Tank, displayed having 'thrown' a track. History: To help 'sell' his (hair-brained) idea of a Greek Campaign, Churchill sent around 50 of these tanks to cover the Anzac troops, 48 of these tanks broke down, mainly with track problems. Part of the logic behind Churchill's actions in sending troops to Greece was to impress the Americans. said the U.S. ambassador to Britain. Marshall assembling a very complex limber for his 25 pounder. Marshall has scored the most detailed of all the models and the most difficult and is achieving great success with them. A few weeks ago, doing a superb job, John finished off his initial work, a Japanese fighter plane. 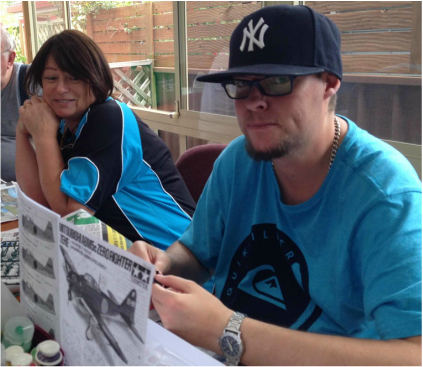 Lisa, besides being a superb maker of cakes for morning tea has turned out to be a great assistant in doing something she had not done before, putting model aircraft together. The Crete Campaign, four 1:32 German Fallschirmjäger paratroops are being assembled and painted, while 1:72 Valiant Miniatures for the background scenes are being painted. 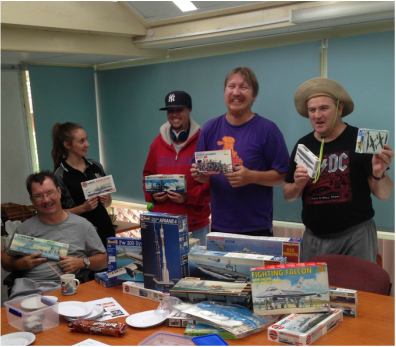 The staff at CCDN, mostly persons of the women kind have adapted well to the the mostly 'blokes' domain of model building. It's no wonder they praise themselves so much for their multi-skilling. Above: Marshall is undertaking a very detailed limber for a 25 pounder, this will be depicted making a stand at the Brallos Pass near the famous ancient battle ground of Thermopylae. ​the dioramas produced in the program as visual aids.